2018 Pikes Peak Marathon winner, the U.S. runner Dakota Jones digs deep on the skinny Scottish ridges. Bloodied, bruised and splattered with mud, but smiling as they crossed the finish line, both male and female winners had apparently enjoyed hurling themselves to victory down the slippery, rocky Scottish mountainside. It was Saturday September 15, 2018 and the weather was typically British—cool and breezy, with smoky clouds whisping around the higher summits. Days of recent rain made the rocky ridges perilously slippery and turned the once-grassy paths into a mud bath. This was the Ring of Steall Skyrace, deep in the UK’s Scottish Highlands, the event that would decide the winners of the 2018 Skyrunning World Championships and the Golden Trail Series. At home on the most testing, technical terrain, Kilian Jornet (arguably the world’s best mountain runner)—not surprisingly—came first, smashing the record by 20 minutes and winning the Skyrunning World Championship. The 30-year-old, Catalonian, multiple ski and trail-race champion ran the 18-mile course with 8,200 feet of ascent in 3 hours 4 minutes, annihilating teammate Stian Angermund-Vik’s 3:24 record from last year. Jornet’s chin was covered with blood as if he had been literally fighting hand to hand for the victory with 24-year-old Italian ski-racer Nadir Maguet, who finished just over a minute later. Runners bust out of the gate, enjoying a break in the weather. He then started laughing at himself, covered head to toe in mud, and with blood dripping down his chin. It was clear he had needed to go all out for the win. Then suddenly third-place runner Angermund-Vik came in, a mere three minutes later, still knocking 15 minutes off his course record time from last year and cartwheeling over the line again, getting applause from the crowd. Comprises four Skyraces over four days—Mamores Vertical Kilometre, Ben Nevis Ultra, Ring of Steall Skyrace and Glen Coe Skyline. 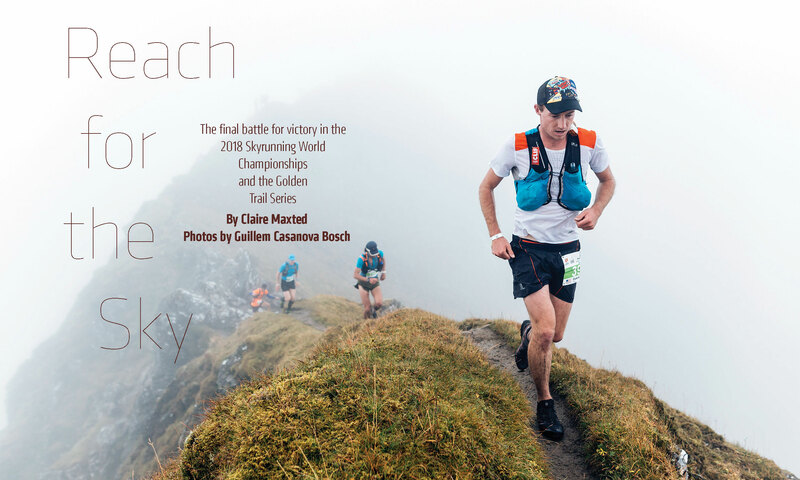 This year the Ring of Steall Skyrace (18 miles/8,200 feet of climbing) was the fifth in the Golden Trail Series and the final race of the 2018 Skyrunning World Championships, Sky category. Pronounced like steel the metal, means spout. A creek, stream or river. A 15-kilometer east-west ridge of mountains in the Lochaber area of the Grampian Mountains in the Scottish Highlands, between Glen Nevis and Loch Leven. A selection of 282 Scottish mountains over 3000 feet (914 meters) first published by Scottish mountaineer and founding member of the Scottish Mountaineering Club, Sir Hugh Munro (1856-1919), who strangely, never actually completed his own list. The remaining 227 Scottish mountains over 3000 feet that don’t have a significant enough drop (approximately 500 feet prominence) on any side to be considered as separate Munros. Scotland’s most famous long-distance walking route, 96 miles from Fort William (a few miles north of the race venue in Kinlochleven) to its biggest city, Glasgow in the south. The American Hillary Gerardi gets after a Grade 3 scramble on Curved Ridge, the first major ascent. In sharp contrast to Jornet’s fame, a complete newcomer to the Skyrunning scene stole the women’s victory. Tove Alexandersson from Sweden crossed the line almost 19 minutes ahead of Laura Orgue’s record in 3 hours 46 mins and 39th place overall. The 26-year-old is well used to battling her way over harsh ground, having dominated the World Orienteering Championships for the last two years. Like Jornet, she also skis and is one of the few orienteers who competes both on skis and on foot, winning the World Ski Orienteering Championships sprint distance in 2015. She ran her first ever Skyrace at Limone in 2017, surprising everyone by collapsing, totally spent over the finish line 12 minutes ahead of much-more experienced Skyrunners Michelle Maier, Ragna Debats and Laura Orgue. 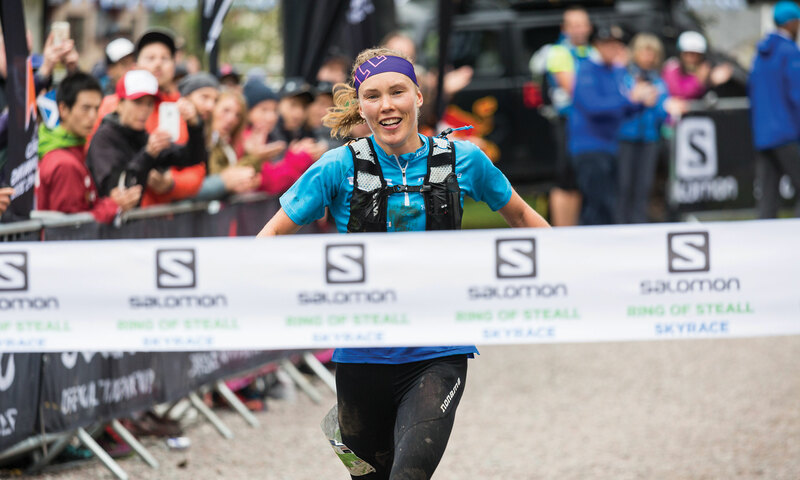 Here at the Ring of Steall, Alexandersson beat two top British runners, the multiple record-breaking British Fell Running Champion Victoria Wilkinson and the winner of Montana’s The Rut 28K two weeks prior, Holly Page. The flat start quickly led to steep, forested trails. Alexandersson calmly displayed a bloody graze on her hip and a slice of skin dangling off the raw palm of her hand. The high, exposed and rocky Scottish terrain required quick footwork and a head for heights. With so many top athletes finishing bloodied, battered and bruised, it does beg the question, What kind of course is the Ring of Steall if it eats even the top athletes for breakfast? 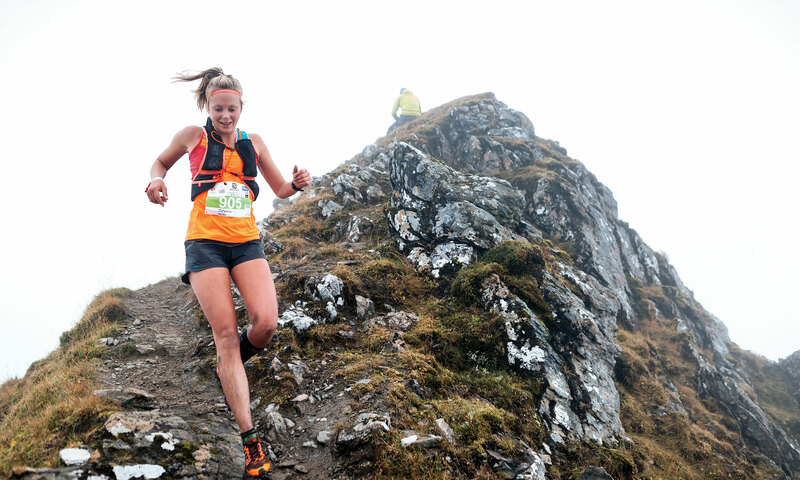 Deep in the heart of the Scottish Highlands, this Skyrace is not for the faint-hearted or fair-weather runner. It’s based on the eponymous classic British mountain-hiking circuit over four Munros—a selection of 282 mountains over 3,000 feet, originally compiled by the mountaineer Sir Hugh Munro in the early 20th century. The race starts and finishes outside the IceFactor National Ice Climbing Centre in the small tourist town of Kinlochleven. First, there’s a steep zig-zag climb through the forest on the famous West Highland Way, Scotland’s most famous long-distance hiking trail. Then runners break out on to the open Mamores mountainside, following a skinny, peat-bog path beside the Allt Coire na h-Eirghe (a river) to the first summit of Sgurr an lubhair (3,284 feet). Runners must then cross a nail-biting scrambling ridge of precipitous rocks known comfortingly as the Devil’s Ridge to bag their first Munro, Sgurr a ‘Mhaim (3,605 feet), the highest point on the route. Here, on a clear day, they are rewarded with a fantastic view of the UK’s highest mountain, Ben Nevis (4,409 feet) directly opposite, before a dramatic 3,300-foot descent down the grassy northwestern flanks into Glen Nevis. Here, the race’s only aid station provides snacks and water before the route continues alongside the Water of Nevis. This river is crossed just after the impressive waterfall of An Steall that features (blink and you’ll miss it!) in the fourth Harry Potter movie when Harry fights the dragon. Now with wet feet, the runners face a second significant climb over the next three Munros in quick succession along a high ridge. First comes An Gearanach, with more exciting, rocky scrambling on the descent to a high-mountain pass, followed by two more stiff climbs over Stob Coire a Chairn and Am Bodach. From this last peak, unless you’re battling either inclement weather or Jornet/Alexandersson for race places, runners would be wise to stop a moment for a full 360 panorama, a toothy horizon of Scottish mountains. They can also scan the entire epic route with their tired eyes, before gathering the strength to slip and slide back the way they came, to meet the cheering crowds in Kinlochleven. 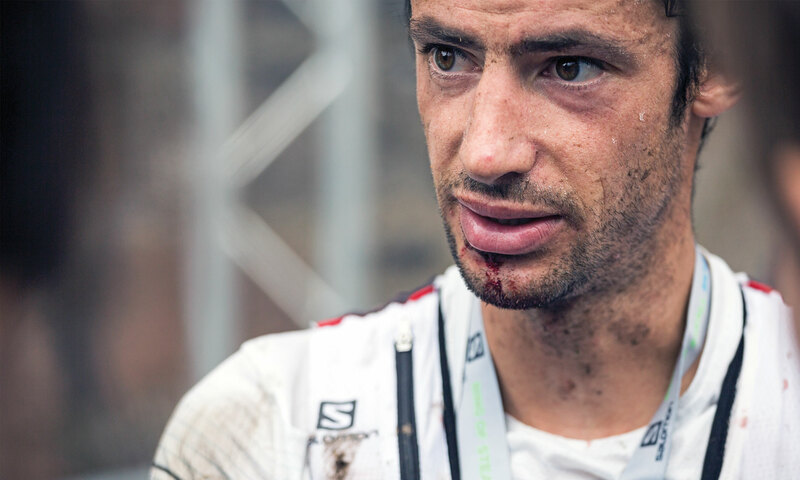 Kilian Jornet, chin bloody from a fall on the descent while being chased by eventual second-place finisher Nadir Maguet. But that’s not all. 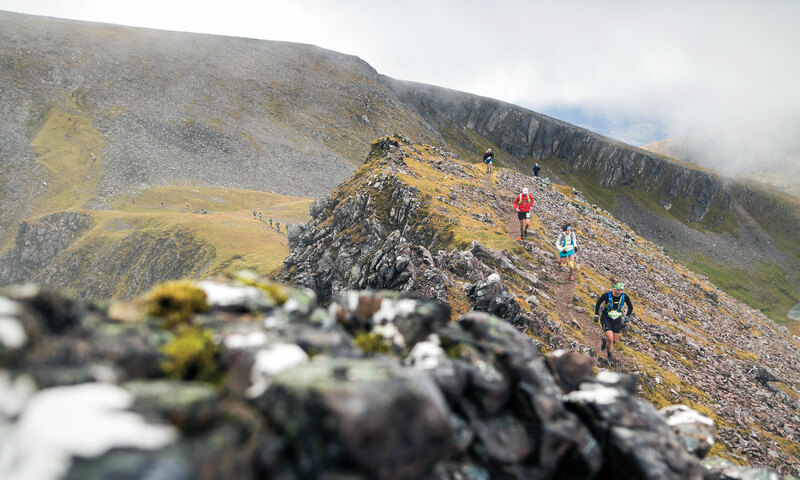 There are four Skyraces in total within the Skyline Scotland event, starting with the Mamores VK (Vertical Kilometre) on the Thursday, then the Ben Nevis Ultra on Friday, Ring of Steall Skyrace on Saturday and the Glen Coe Skyline on Sunday. The Mamores VK is a grueling enough climb in itself, only three miles in length but with 3,300 feet of climbing up a nearby Munro, and this year’s race was made all the harder for the tough weather conditions at the summit. Battling his way to the top through the wind and rain to smash the course record by over two and a half minutes was Switzerland’s 23-year-old superstar Remi Bonnet (39:23). 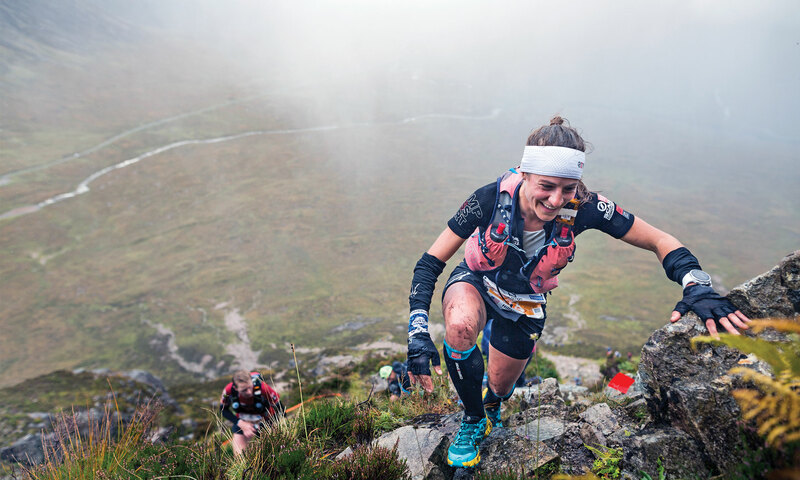 Spain’s Laura Orgue looked similarly soaked through and frozen as she fought for the ladies win, smashing her own course record by almost a minute to finish in 51:35 and claiming the Vertical Skyrunning World Champion title. Unfortunately the bad weather worsened and the next day, driving wind and rain forced the organizers to use the bad-weather, alternate route for the Ben Nevis Ultra. This 32-mile race with a monstrous 13,000 feet of climbing was shortened to 30 miles with only 5,400 feet of ascent, missing out on the UK’s biggest mountain (Ben Nevis) and sticking to the valleys and mountain passes. Britain’s Jon Albon took the men’s victory with 3:48:02 while Ragna Debats from the Netherlands won the ladies in 4:36:20, crowning both athletes Ultra Skyrunning World Champions. 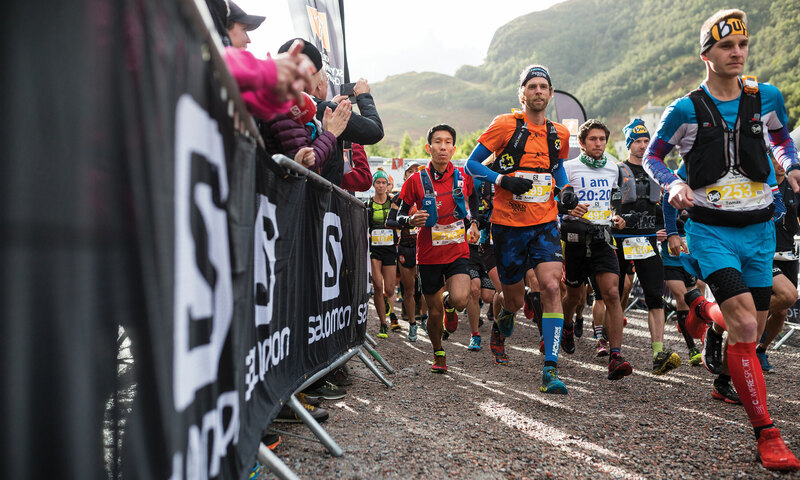 Thankfully the weather cleared enough to run the full Ring of Steall Skyrace course of 18 miles with 8,200 feet ascent, as described above, which saw course record breakers Jornet and Alexandersson crowned as Skyrun ning World Champions for the Sky category. This was also the fifth race in the Golden Trail Series, and, once the points had been counted, revealed the top 10 runners heading to the grand finale at the Otter Trail in South Africa in October, 2018. Disappointingly, the weather again made a turn for the worse and high winds forced another shortened course on the final race, the Glen Coe Skyline. Runners were still able to climb the first epic scramble of Curved Ridge, but the second scramble traverse along the knife-edge ridge of Aonach Eagach was abandoned, reducing the ascent of this 32-mile course with 15,600 feet of climbing by roughly 6,500 feet. Slightly surprisingly (but then again not really! ), Jornet won the men’s race in 3:37:17. Hilariously, he was chased on the first climb by Salomon Team Manager, Greg Vollet, dressed in a giant bee costume following Jornet’s bee-sting-related UTMB drop from a couple weeks earlier. This bee then found itself caught up in the ladies sprint finish as American Hillary Gerardi and the UK’s Jasmin Paris battled to the line. Gerardi won the ladies race in a time of 4:17:48 (an impressive 23rd place overall), with Paris only seven seconds after her. Despite the shortened courses, each race was thrilling and as tough as you can imagine in such typically Scottish weather. The crowds packed out the Ice Factor and watched the live-tracking boards as the racers battled it out for position over the rocks and bogs. The anticipation for next year’s event is high. The only question is, will Jornet ramp it up to win all four races in 2019? The Skyrunning newcomer and Swedish orienteering champion Tove Alexandersson takes first for the ladies. Claire Maxted is the co-founder and former editor of Trail Running magazine in the UK. She now operates Wild Ginger Films YouTube channel packed full of trail-running advice, gear tests and inspiration, including live coverage of this momentous event: http://bit.ly/SkylineScotland.